Whether we like it or not, we are moving into the colder season which is the perfect time to snuggle up with a good book. There is a number of books to select from so it may be difficult to decide which one to choose and read. Of course, with me, I love a great self-help/spiritual book that leaves the reader feeling empowered and inspired to make positive changes in their life and do great things in the world. So with the Fall season here, I thought it'd be the perfect time to share some of my all-time favorite books with all of you. Conversations with God: An Uncommon Dialogue, Book 1 by Neale Donald Walsch I am not religious but if anyone asked me what is the closest thing to the Bible for me, I would say this book. This life-altering book is all about Neale Donald Walsch's conversation with God (how fitting the title huh? 😆) and tackling some major topics that we've all had questions about at some point in our lives. Whether you believe in the premise of the book or not, the points and explanations made are very thought-provoking and comforting to the spirit. I highly recommend this book to anyone who is spiritual and open-minded. Peace From Broken Pieces: How to Get Through What You're Going Through by Iyanla Vanzant Right before her major comeback on the OWN Network, Iyanla Vanzant published a deeply personal, heart-wrenching autobiography of her life. She openly explored her childhood, dissected her rise and fall with fame and shared her intense pain of losing her daughter on the earthly realm. If you are going through some things or have gone through some issues in the past, this book will have you reflecting back on your own life in new ways. Daring Greatly: How the Courage to Be Vulnerable Transforms the Way We Live, Love, Parent, and Lead by Brené Brown If you ever wondered about the role of shame and vulnerability, then look no further. Brene is a true expert on this subject. From her immensely popular TED Talk to her insightful interviews with Oprah Winfrey, she garnered the world's attention with her honest, straightforward response to these deeply-rooted issues. In Daring Greatly, she unpacks this subject even further making you, the reader, clearer than ever about how much vulnerability and the fear of it creates so many blockages and road blocks in one's life journey and most importantly, how to break free from them. 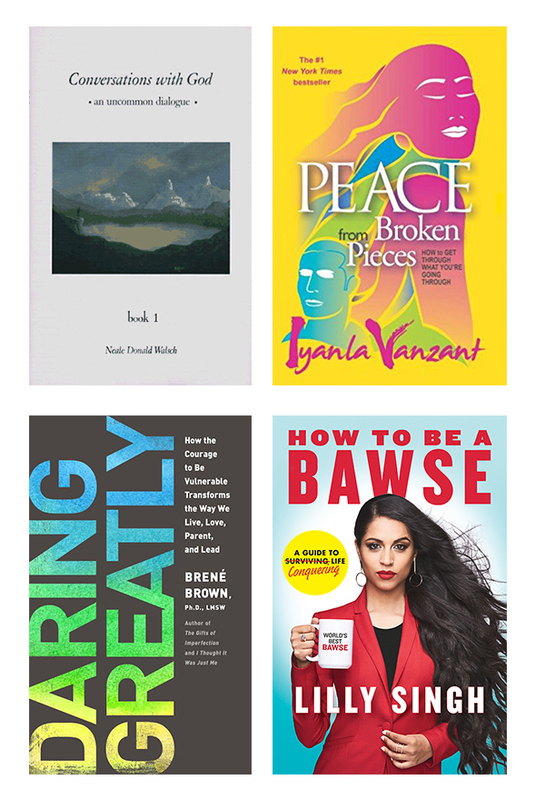 How to Be a Bawse: A Guide to Conquering Life by Lilly Singh Previously, I mentioned Lilly's mind-blowing career and great charitable deeds HERE. Since then, she has published a New York Times Bestseller book which seems fitting for a bawse. In the pages, she openly and candidly reveals how Lilly turned into the superwoman we all know and love and simultaneously offers real-world practical advice that we can all take from - young and old. What are your favorite books for the Fall season? Have you read any of the books listed? If so, what did you think? Let me know! Confession: I'M a scaredy cat & I’m okay with that. Scars, Stretchmarks, Cellulite, Oh WOW!